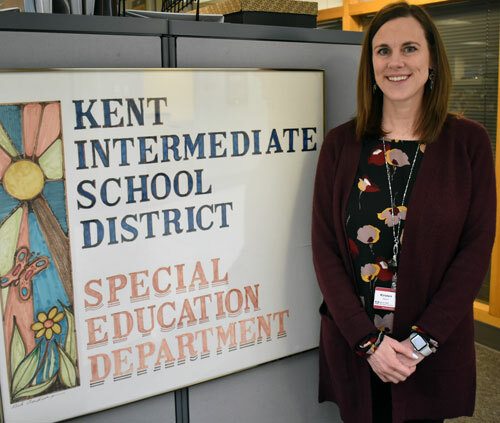 As the new director of special education for Kent ISD, Kirsten Myers has come full circle. Growing up, Myers says she spent many hours helping her mother, Dianne Cromwell, a school social worker at Kent Occupational High School. The now-closed school for special education students was located on the same Kent ISD campus where Myers occupies her new office. 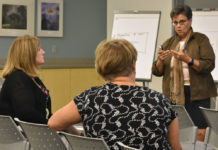 Myers was recently hired to replace Laurie VanderPloeg, a veteran administrator who was appointed last October to be director of the Office of Special Education, the agency within the U.S. Department of Education that serves and oversees special education programs throughout the country. For the past 23 years, Myers was employed by Rockford Public Schools. She was in charge of the district’s special education services for the past 15 years. 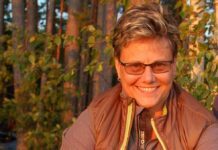 While the old Kent Occupational High School where her mom worked closed more than 25 years ago, Myers said she learned the value of giving dignity and respect to special needs students. Myers’ passion for teaching extends beyond her mom and resume at Rockford Schools. Her husband, Brent Myers, is a teacher and coach at Forest Hills Northern High School, located about half a mile from Kent ISD’s main campus along East Beltline Avenue NE. Two of their children attend Forest Hills Northern while their oldest daughter is a freshman in college. “A large majority of my aunts and uncles also were in education,” she says. One of her aunts was a principal at Holland High School while another aunt was a principal at Mulick Park Elementary School. An uncle served as a deputy superintendent of curriculum for the Grand Rapids Public Schools while another uncle taught at GRPS. A brother-in-law teaches in Grandville and a sister-in-law teaches in Grand Haven. Dianne Cromwell, her mom, retired from the Wyoming School District in 1998 but still works under contract with the Walden Green Montessori and West Michigan Academy of Arts and Academics. Most importantly, Myers traces her passion for education to her late grandmother, Frances Cox, who raised five children and went back to college to get her teaching degree in her early 40s. Her grandmother then taught for 20 years in Grand Rapids Public Schools. 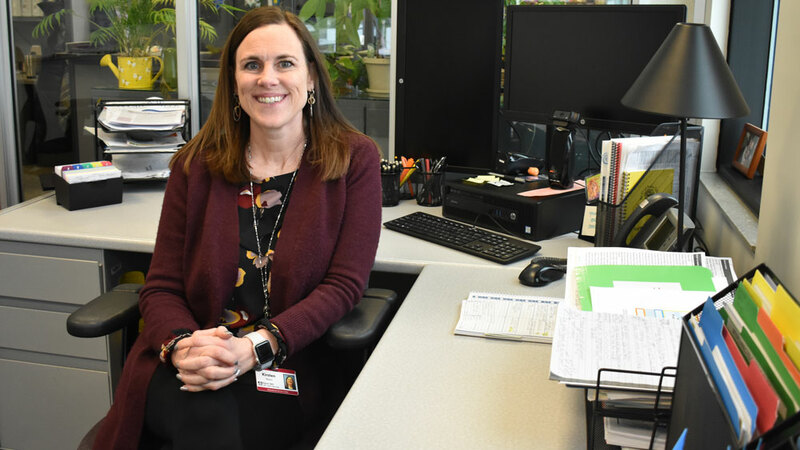 In her new job, Myers is dedicated to keeping as many of the 14,500 special education students in Kent County as possible in the mainstream of their home school districts. 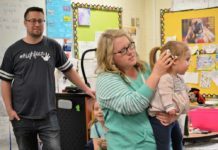 She proudly points out that the Rockford system – despite years of enrollment growth — has about half of the special education students as it did when she began with the district. One key is early intervention for students who have special needs, Myers says. Using a process called “multi-tiered systems of support,” educators strive to identify learning disabilities early and accommodate their deficits while keeping students in the classroom with their peers. Myers says she will focus on making sure the ISD’s 20 local school districts have all they need to effectively manage their special education programs. That includes developing programs to help special education professionals work more closely with parents. She also wants to help the local districts create programs that promote mental health beyond the special education programs. 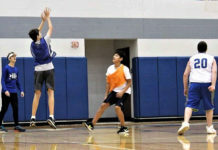 In Rockford, Myers was instrumental in “Developing Healthy Kids,” a district and community initiative aimed at making students and families more aware of mental-health issues, substance abuse and factors that can lead to depression and suicide. 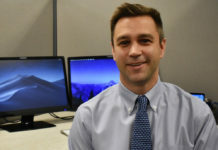 Myers also will be working closely with Paul Dymowski, who was recently hired as director of the center-based special education program that is transferring to Kent ISD from Grand Rapids Public Schools. The GRPS School Board voted in August to turn over operations of its center-based programs to Kent ISD. These specialized programs serve 1,385 students who have cognitive and physical impairments and autism spectrum disorder that exceed the capacity of their schools. Most of the buildings for center-based programs, like Lincoln Developmental Center and Pine Grove Learning Center, are owned by Kent ISD. The center programs are operated by GRPS, which employs about 425 staffers, including teachers, therapists, paraprofessionals and other specialists. Despite the challenges of taking over the program, Myers says she is confident they will hit their July 1, 2019 deadline for completing the transfer.